The sudden release of Five Nights at Freddy’s 3 made it one of the most talked-about game sequels in recent times. If you are not familiar with FNAF 1, 2, and 3, your first inclination might be to look it up on the internet. There, you will find dozens of results, and a shocking amount of videos of people playing the game while recording their reactions. Let me warn you first, though, before you go on and watch any of these videos: FIVE NIGHTS AT FREDDY’S WILL MAKE YOU POOP YOUR PANTS FROM SHEER TERROR. I’m not being in the least facetious about this. Around fall-time, 2014, one of my roommates and good friends told me about the first game—this was months before #2 and #3 came out. When she was explaining the concept to me, I knew that it sounded like a game that I would never play, because I’m a big chicken. The basic premise to FNAF is that you play a first-person role as a security guard at a Chuck-E-Cheese type of restaurant, call Freddy Fazbear’s. The goal of the game is to complete a shift of guard duty, starting at midnight and ending at 6AM. Your basic duties are to check the security cameras, monitor your battery usage, and try to survive as POSSESSED ANIMATRONICS COME TO LIFE TO MURDER YOU. Worker’s Comp. does not cover costs of bodily harm inflicted by robotic chickens. If you want to learn more about FNAF, check out the page about it. The thing about this game is that we were so intrigued that my friends and I decided that we were going to watch a YouTube play-through. The particular YouTuber we watched is named Markiplier, who is a well-known gamer on the video-sharing website. At the time we watched it—around five months ago—the video had about eight million views. Today, it has 26,268,142 views. Needless to say, this game has become a pretty big thing. Markiplier (the guy I talked about earlier) has over 6.5 million subscribers on YouTube. 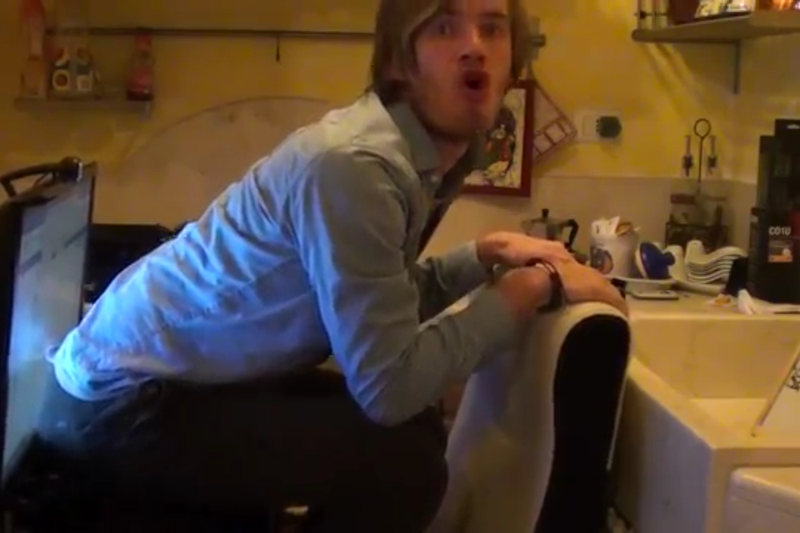 PewDiePie, who is another well-known YouTube gamer, has 35 million subscribers. How do they get so many subscribers?? I think you’re doing it wrong. The release of the first Five Nights at Freddy’s had a huge impact on the numbers above, simply because these YouTubers’ videos were shared so much, which made people interested in the channels. That’s how YouTubers get so many subs. But the interesting part about all this is that viewers could have easily gotten the demo of FNAF, but chose to watch a play-through instead. This has been made clear in many online videos, including the Honest Game Trailer for FNAF, and the Game Theorist’s video. Quite honestly, though, you could not pay me enough money to play that game. I refuse. But I will watch someone else play it, because it somehow—don’t ask me why—makes me feel safer. Video games are designed to create the illusion that you are right there in the action; whenever I play the zombie mod on Call of Duty: Black Ops, I fear for my life. If I were to watch someone else play the game, whether in real life or on YouTube, I’m not nearly as scared. Simply put, I like watching other people play video games, and I always have. And according to those numbers above, others do as well. Why though? Why would we rather watch someone play Five Nights at Freddy’s versus playing the game ourselves? In this moment, I realize that just as gamers experience perceived reality, we get hit with a double perceived reality when we watch YouTubers play the same game. It’s perceived reality Inception, or “prealception.” No? Okay. The concept of perceived reality is greatly talked about by Shapiro and Chock (2004), to throw some real deal facts at you. They’re going to be the ones to help us understand the popularity of YouTube gamers. According to them, “people are more likely to accept atypical people and atypical events from an unfamiliar setting that therefore see them as more real” (p. 675-676). When these YouTubers play video games, their viewers become connected to them because, just like the viewers, these YouTubers are people just like you and me. As it is further explained in the article, “the more typical the people and events described or portrayed…the more realistic those people and events were judged to be” (p. 675). As these YouTubers state opinions and share their reactions to video games, viewers form a deeper connection; the YouTubers become more humanized through their interaction with the games and with their viewers, thus becoming tangible figures despite the barrier of a computer screen. With the advancement of personal technology (i.e. smartphones), YouTube can be accessed anywhere. Whether on a computer or on a personal device, YouTubers can be watched wherever the viewer so chooses. Once again, we can turn to our good pals Shapiro and Chock to explain. In their study, they say that “Generally, in a familiar environment audience members can be relatively certain of what is typical. They are unlikely to become convinced that atypical behavior is more typical than the viewer thought” (p. 677). In other words, when the YouTubers’ videos are watched in a comfortable and familiar spot of a viewer’s choosing, the YouTubers become even more likable. Now, I know this is getting a little bit academic, but bear with me. What this study says and how it can be related to the notion of perceived reality all lies with how the viewers perceive the YouTubers to be. Our only semblance of their existence is what they decide to record and put up online. As we watch them, we know that 1) we can’t physically interact with them, though 2) we know that they are physical beings, but without face-to-face contact with us as viewers, the YouTubers become mediated characters. Viewers know that in reality these YouTube gamers exist, but without face-to-face contact, the viewers only have perceptions of what they are actually like when these YouTubers are in front of the camera and off camera. 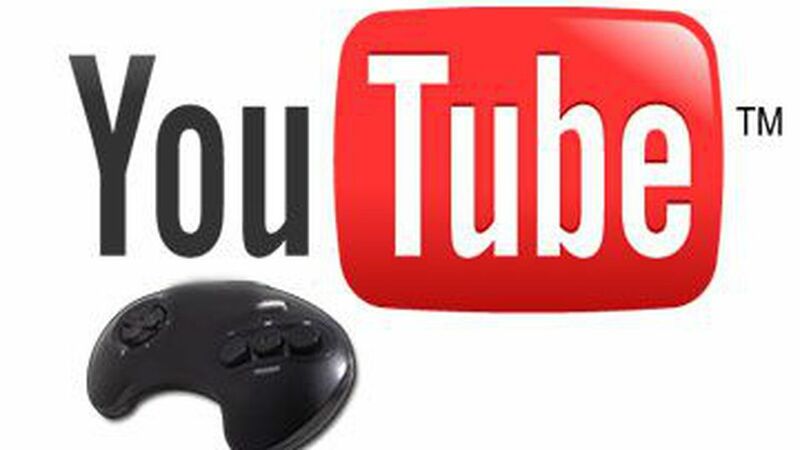 As a result, YouTube gamers become characters to us—almost like the characters we would play as in a video game—which is another reason why we can connect with them so well. It is my belief that the notion of perceived reality is the reason why YouTube gamers have so many views and so many subscribers. They are people that we can connect with, watch from the comfort of our own personal spaces, and ultimately turn off at any time. Additionally, these YouTubers are not fully aware of a viewer’s opinions about them, unless you were to write your undying love for Markiplier in the comments of his videos. YouTube gamers are known to exist, but without a physical being standing in front of you, playing video games in your presence, they become as personal as your favorite character on Sherlock. Perceived reality is also alive and well when you watch a YouTuber play a video game. Because a viewer is not actually playing the game, and is instead watching someone else play the game, “prealception” is experienced. “Prealception,” or perceived reality Inception, is something that I came up with for this situation; so, if a YouTuber (who we know is personifying perceived reality) is play a video game like Five Nights at Freddy’s (which is a first-person experience, and video games automatically embody perceived reality), then BOOM! Perceived reality Inception. I’ll give you a moment to recover from your mind being blown. I believe that “prealception” is the reason why viewers would rather watch a YouTube gamer play FNAF rather than play it for themselves. These YouTubers have become more than just characters to viewers, they are professional gamers who review games for a living, which makes them trustworthy. By watching a YouTuber play a scary game like FNAF in a comfortable environment, the pressures that are placed on the first person player are alleviated. Plus, when a YouTuber makes a mistake while playing a video game, it makes the viewer connect to them even more on a more human level. This is applicable to all the game genres that these YouTubers play. Watching rather than playing, in a way, makes the game more enjoyable, especially when the YouTuber gives funny commentary or reacts in an entertaining manner. So yes, based on the theory of perceived reality, and my atrocity of the “prealception” theory, I will say that I would rather watch someone else play than play a game for myself—depending on the game. Pokemon Blue? Yes, definitely. Five Nights at Freddy’s? Absolutely not. But that’s what YouTube gamers are for; they expand our gaming horizons, introduce us to the new and innovative, and help us process and sometimes enjoy scary games. So, thank you Markiplier, and to all the other YouTube gamers, for allowing me to experience second-handedly the terror that is Five Nights at Freddy’s in the comfort and safety of my own dorm room. As if I needed another reason to not sleep. My exact reaction when I watch this game.